Count Dracula lives in my attic and he has a casket for a bed. He has bitten all of my family members and they're undead. I've told many people but they don't believe my texts. All of my family members are vampires and I'm next. 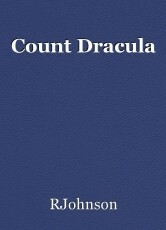 Dracula prowls during the night and returns before sunrise. My family prowls with him but people think I'm telling lies. I've kept the vampires away so far by locking my door and wearing garlic. They haven't bitten me yet because they fear that I will make them sick. I fear that sooner or later, I will be turned into a vampire. I've looked online but I can't find a monster killer to hire. I'm sick of hiding like a coward, I've had all that I can take. I found a knife and I just got done carving a wooden stake. Dracula is pounding very hard, he's trying to break down my door. He has succeeded but I stabbed him through the heart and he just hit the floor. Because Dracula was the original vampire, my family has died as well. I feel so calm and relaxed because my life will no longer be a living hell.